I was inspired by a recipe for refried beans using bean flour so I figured I’d try and make some soup out of bean flour. It turned out good. 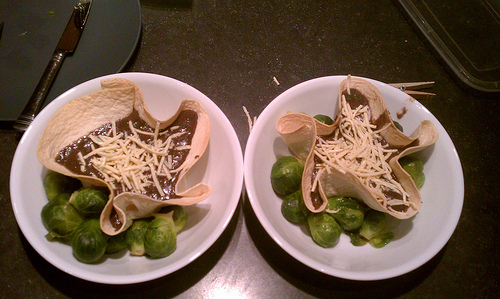 We decided to pour the soup into edible tortilla bowls and serve it with steamed brussel sprouts. 3 roasted poblano peppers seeded and skinned and stems removed diced fine. bring water to a boil and add dry ingredients and braggs and mix well and low boil for about 10 minutes. Then add the tomato sauce and peppers and cook for another 10-15 minutes. at the end add in the cilantro and green onions. Add some vegan cheese on top. add salt or hot sauce to taste if you need some additional seasoning. A food dehydrator is a great investment. You pick one up fairly cheap and there’s so much you can use it for. 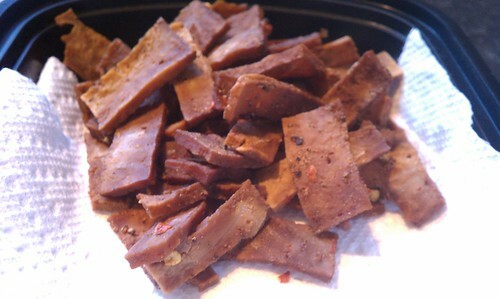 Back before I became a vegetarian, I used a dehydrator to make beef jerky quite a bit. After I stopped eating meat I missed the texture and seasonings of beef jerky. I tried quite a few of the vegan jerky products out there and although I enjoyed several of them, they were quite expensive. Even when buying them in bulk I wasn’t able to save much. I figured it couldn’t be that hard to make a jerky substitute at home. After looking online I was able to combine a few different recipes and cooking methods into what I felt was a pretty good batch of tofu jerky. The method I use here has a similar texture and consistency to the Turtle Island tofurky jurky. The seasonings can be played with quite a bit. I’m not one to get obsessive with measuring spices and I usually just dump in what I guess is a fair amount. Start by draining and pressing the tofu using whatever method you prefer. Once the tofu has been drained you can cut it into strips that are about 1/4 of an inch thick. I find that anything thinner can cause the tofu to get crispy and lose it’s chewy consistency. 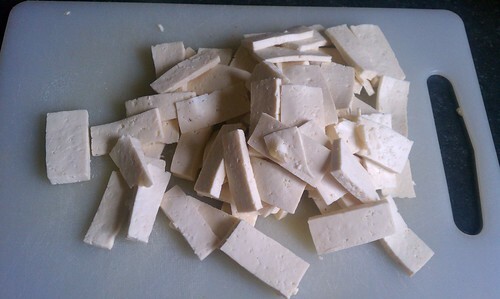 The photo below shows `1 block of tofu that has been cut. If you like you can cut longer strips. I usually cut long strips and then chop them in half so the jerky is easier to pack in small areas like a pocket or bike jersey. Once it’s been drained and cut you can combine all of the other ingredients and mix them. Then place the tofu into a pan and pour the wet mixture on top. try and make sure most of the tofu has the wet mixture on top of it. You’re going to let it marinate for about 4-5 hours. It’s a good idea to move the tofu around every hour or so to insure that it’s evenly marinated. 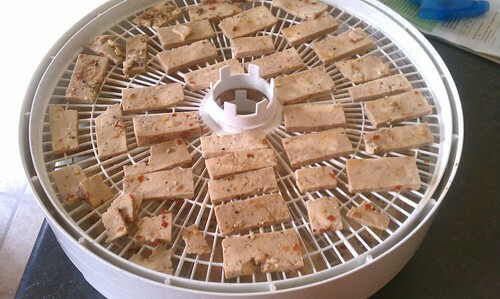 After it’s been marinated you can add the tofu slices to the dehydrator sheets. 2 blocks of tofu should fill up 4 round trays. The slices will shrink down quite a bit after they’ve been dehydrated but it’s best not to have them touching if possible.